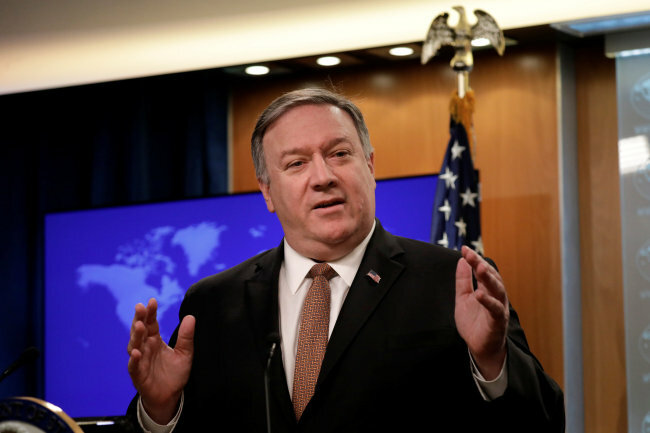 The US is committed to engaging North Korea, and “sequencing” of denuclearization-related actions led to the summit in Hanoi ending without an agreement, US Secretary of State Mike Pompeo said Monday. Speaking in an interview on KCMO, a Kansas-based radio station, Pompeo said that while he cannot reveal details of the summit, differences in the two sides’ ideas about the sequence of denuclearization caused its collapse. “But it’s clearly a range of issues around timing and sequencing and how it is we achieve this,” Pompeo said. The second US-North Korea summit held in Hanoi on Feb. 27 - 28 was cut short without any agreement being reached. US President Donald Trump later elaborated that the North effectively demanded full sanctions relief in return for a limited part of its nuclear weapons program. North Korea, which has long demanded “action for action,” denied Trump’s statement, saying it only sought the lifting of sanctions concerning the livelihoods of its people. North Korean Vice Foreign Minister Choe Son-hui has since stated that the US missed a “golden opportunity” and that North Korean leader Kim Jong-un will soon make a decision on whether to resume nuclear weapons testing. In the interview, Pompeo echoed Trump in stressing that North Korea will have a brighter future following complete denuclearization. “But it must follow -- it has to follow the verified denuclearization of North Korea,” he said. In an interview with B98 FM, another Kansas-based radio station, Pompeo said that progress is still being made. “It’s been a decadeslong challenge. But we have the toughest economic sanctions in history, but the most promising diplomatic engagement in history as well,” he said.